Every year we visit Myrtle Beach several times with our family. It is always a good time and we can't ever get enough. Most people prefer going to the beach in the summer, but we feel differently. We go no matter the season or weather. One of our favorite times of year to travel to Myrtle Beach is in the winter. Yes, winter! I've come up with a short list of reasons why you should visit Myrtle Beach in the off-season. We love an oceanfront view! Great weather- The weather is often times still mild in the beginning of the winter season. Next week will be in the lower 70's and upper 60's. Not bad if you love to walk on the beach like we do! Lower cost to stay oceanfront- If you love listening to the sounds of the ocean, you can stay in an oceanfront condo for less than you think. A condo offers all of the comforts of home including private bedrooms/baths, kitchen, washer/dryer, and dishwasher. Our favorites are Avista Resort and Prince Resort. There are many great amenities like indoor pool/hot tub, fitness center, on-site restaurant/bar to name a few. Check out the rates, you will be pleasantly surprised. Also, most locations don't require a minimum night's stay like they do in the summertime. Often times you can find a spacious 3-bedroom condo for as low as $100 per night! Less crowds- If being in the midst of crowds is not your thing, the off season is the best time to visit. Sometimes you will feel like you have the whole beach to yourself. As long as you dress in layers, you will be good to go. Outlet shopping- Right after Christmas, stores slash prices on merchandise to make room for spring items. This is the perfect time to rack up some good deals on clothing, home decor, toys, accessories, and more. You can even get some holiday gifts for the next year at deep discounts. 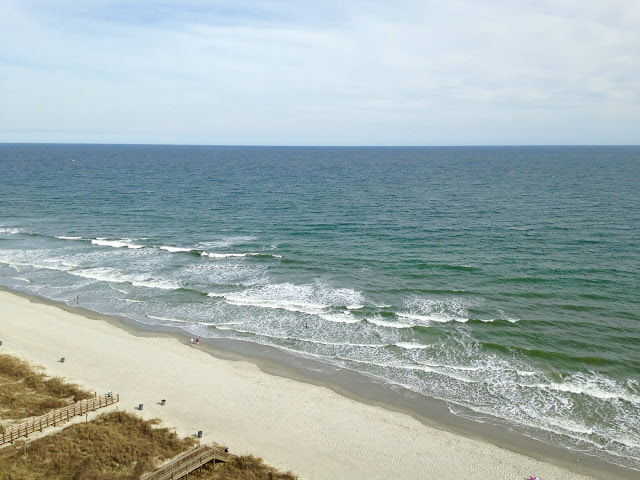 Lots of attractions- Myrtle Beach is full of fun attractions for the entire family. There are themed restaurants, putt-putt mini golf centers, museums, live shows, animal exhibits, holiday festivities, arcades and more. If you plan ahead, you can often times get specials that can save you a few bucks. Make everlasting memories- Being at the beach with your family is a great way to reconnect and have some fun. We make new memories every time we go and have even created new traditions along the way. If you're curious about renting a condo, check out my reviews and tips from previous visits to Avista Resort and Prince Resort. If you have any questions, please feel free to reach out to me.